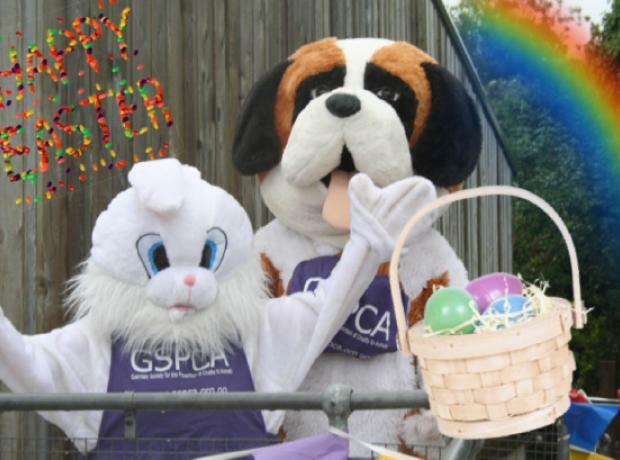 On Good Friday and Easter Saturday the GSPCA Manager Steve Byrne with the Easter Bunny held two fun events for groups of children with their parents. With over 35 children taking part over the two days the families got to see behind the scenes at the GSPCA as well as learning all about rabbits and their care. Each child on arrival received a Treasure Hunt bunny sheet, a lollipop, GSPCA sticker and pen. They then had a picture with the Easter Bunny at the front of the Shelter before being shown around the site in St Andrews. After sell out days at the GSPCA last year for our GSPCA Easter Egg, Bunny and Treasure Hunts we have dates planned for this month. Children meet the Easter bunny and GSPCA Manager Steve Byrne before having a tour of many of the animals, but especially the bunny rabbits. As the groups are shown around they have a treasure hunt to complete whilst learning all about rabbits. After the tour the group arrive at the events room where after finding out the answers and receiving prizes they are issued with buckets for an Easter Egg Hunt. This week over 70 children took part in some Easter fun at the Animal Shelter in St Andrews. Children met the Easter Bunny and GSPCA Manager Steve Byrne before having a tour of many of the animals, especially the bunny rabbits. As the groups were shown around they had a treasure hunt to complete whilst learning all about rabbits. After the tour the groups arrived at the events room where after finding out the answers and receiving prizes they were issued with buckets for an Easter Egg Hunt. Today was the third day at the GSPCA that we have welcomed dozens of children to take part in some Easter fun at the Animal Shelter in St Andrews. Yesterday and today the GSPCA have welcomed dozens of children to take part in some Easter fun at the Animal Shelter in St Andrews.